In the basement of Turtleco, where Don has his partially dismantled timeslip generator stashed, the brain of Adolf Hitler awakens. Confused, it uses its connection to the timeslip generator to open a doorway to Berlin, at the close of WWII, by sheer power of thought. In the flooded streets of New York, a boat carrying equipment for NASA’s asteroid mining operation is being attached by armored henchmen. After one of the guards is killed, the Turtles arrive in their Cyber Samurai armor and take down the robbers before they can get anybody else. Don removes their helmets and finds that they’re nothing more than lifeless corpses, reanimated with advanced cybernetics. From his lab, Verminator-X curses that the Turtles have foiled yet another of his robberies. Finally having had enough, he decides to take some offensive measures. After answering some questions for the police lieutenant, the Turtles decide to split up and patrol for more clues. 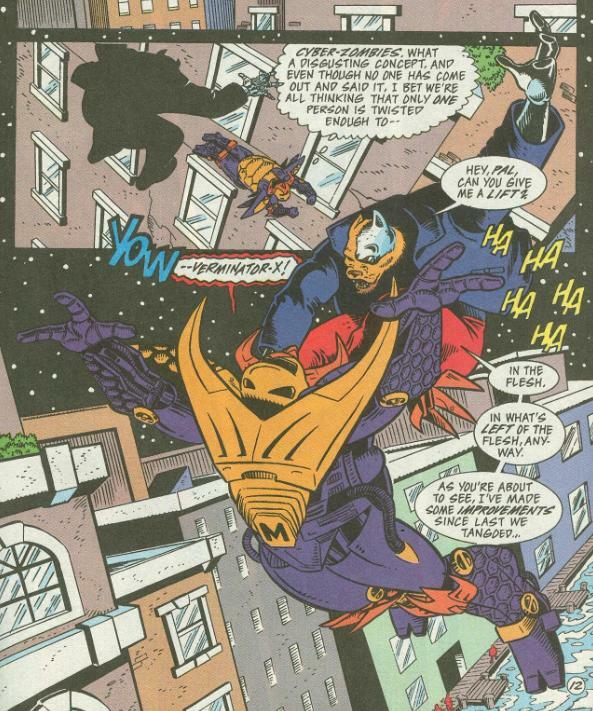 As soon as Mikey is alone, though, Verminator pounces from the top of a skyscraper and begins tearing apart his armor with his cybernetic claws. Landing on the roof of the Empire State Building, Verminator beats Mikey unconscious and prepares to kill him. He’s interrupted by a strange, shadowy alien who encourages him to forget the Turtle and pursue his greater plans. Patrolling the flooded streets, Raph is startled by an alien space craft that bursts out from beneath the water and launches toward the moon. Fearing that something bad has gone down, Raph attempts to contact Mike but gets no answer. Back at Turtleco, Leo and Don determine that the cyborg zombies fit the M.O. of their old enemy, Verminator-X. As Don heads down to check out the timeslip generator he had to abruptly abandon, he finds it turned on and set to Nazi Germany. Even worse, several objects are missing, including the brain. But an even worse crisis pops up, as Raph returns with the battered body of Michaelangelo… and he isn’t breathing. It’s New Years Eve, 1999, and April is about to pay $100 to see Hollywood Hoey’s supposed angel at a Times Square theater. April isn’t about to buy into the hype and hopes to discredit Hoey and prove to the world that he’s nothing more than a fraud. April takes her seat, the lights go down and the curtain rises. At center stage stands a robed woman with wings. The audience is immediately brought to tears by her radiant beauty. 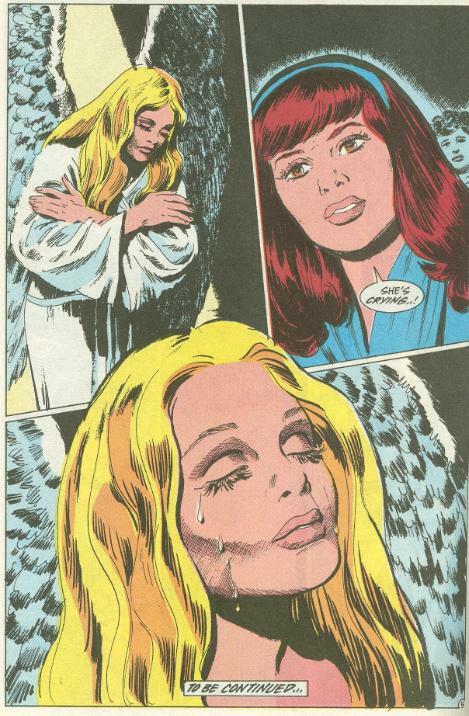 However, the only tears April notices are the ones trickling down the angel’s cheeks. 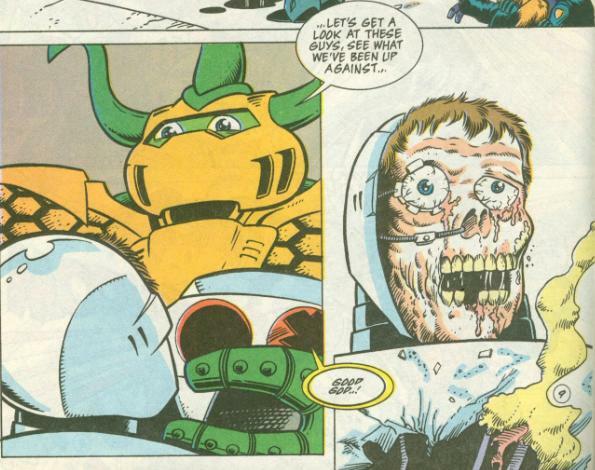 *This story is continued from TMNT Adventures #62. 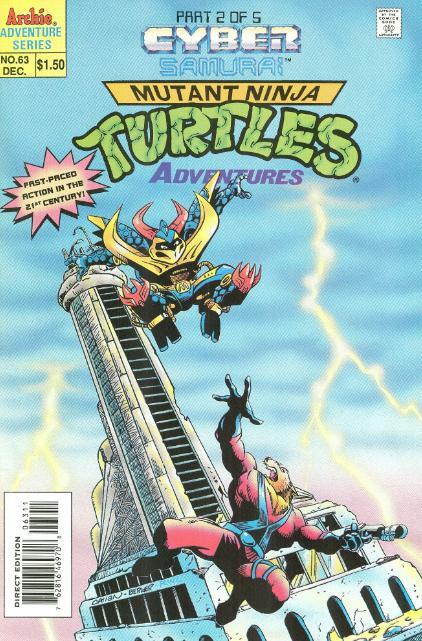 The story continues in TMNT Adventures #64. *This issue also contained a bonus story, “The Angel of Times Square, Chapter II” by Clarrain and Morrow. There’s something gratifying about seeing the Turtles, at least their future incarnations, being hailed and cheered on like superheroes as they swoop down to beat the badguys. Don’t get me wrong; I prefer the Turtles as stealthy assassins that stick to the shadows and try to keep their existence a secret from the world; but possible future stories like this are welcome every once and a while. Again, if you look where Mirage took the Turtles in their interpretation of the future, they wind up living in isolation well into old age. Raph lives in a swamp, Leo lives nomadically, Don has sequestered himself into a lab in the mountains of Japan and Mike… well, don’t know about Mike. While this future is far from a “happy ending” (Lord knows it doesn’t qualify as that), it’s still pleasant to see that as adults, they’ve found ways to keep in touch as family and to use their talents to try and make a bigger difference in the world. Well, all except Raph, who runs a club and sasses police officers trying to solve murder cases. But that’s just Raph. Verminator-X didn’t really get much of an opportunity to shine in “The Future Shark Trilogy” (and neither did the Shredder, for that matter), as he was reduced to little more than a henchman for Armaggon. It’s great to see him cut loose after all this time and we’re given glimpses of a history of antagonizing the Turtles that we’ve missed. 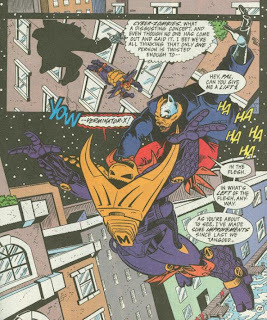 On the other hand, Mikey is sort of played as a joke in this issue; first being ordered around by Don and Leo (which he whines about) and then being easily trounced by Verminator. 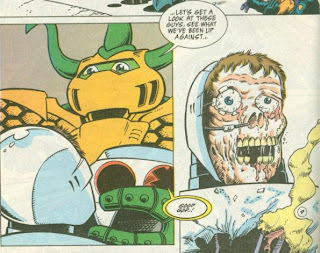 Of all the Turtles, though, Mikey’s the one I always predicted going soft the earliest into old age, as fighting never seemed to sit well with his character. As for the Hitler stuff? Weeeiiiirrrrrd. 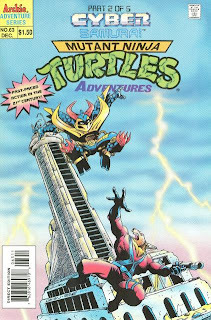 The April back story seems like it would have worked better as a full-length installment in a TMNT Adventures Special. Breaking it up into 5-page chunks that each begin with lengthy recaps is just a little tedious. Still, while I somewhat mocked Gray Morrow’s soap opera art style in my last review, it certainly fits the atmosphere of this tale and the reveal of the Angel is done really well. I remember buying this issue and the previous one, and then part 5. It wasn't until years and years later that I found parts 3 and 4. Thus, parts 1, 2, and 5 are childhood memories while parts 3 and 4 are recent issues that I haven't yet grown attached to in the same way, but were more like welcome surprises in adulthood. They were new to me, after all. It was fun reading this review. I look forward to your review of part 3, an issue I didn't have until more recently. When i read this issue recently i google translate the german lines from the brain haha. It's confused and doesn't know what time it is and what kind of "sorcery" is that of the machine. The brain also sais that "it's the beginning of the end" which i assume refers to the end of the war, of course. this arc was pretty weird and awesome at the same time. Good review Mark! ^ nice with the translating! Your comment on the letter grade is all the more amusing since both actors have gone on to voice TMNT villains.